As with everything else all good things must come to an end. 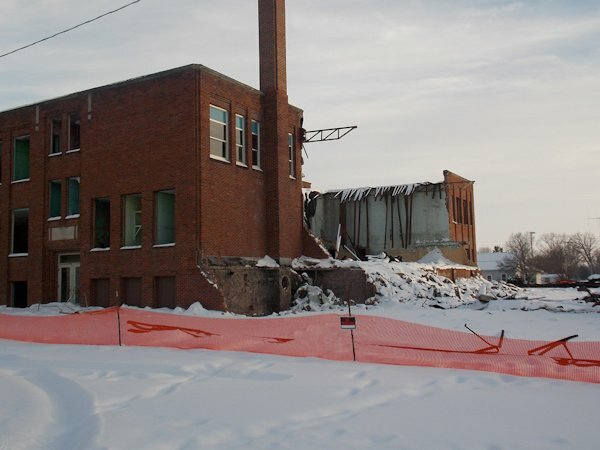 The Blandinsville school in B'ville, as it is commonly known, has come to an end. 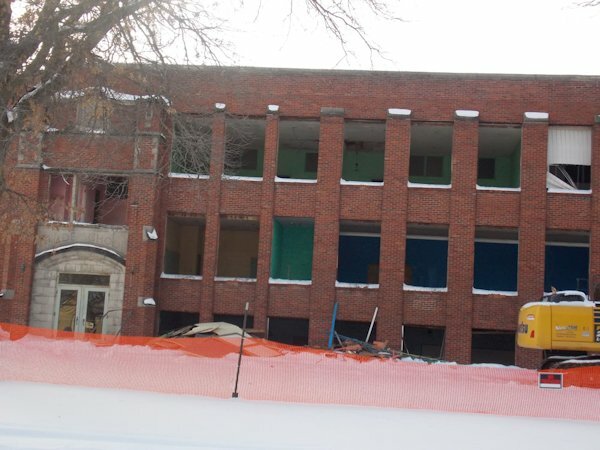 The school has been being demolished for the last couple of weeks. Here is a little history on the Blandinsville school system. The Blandinsville school system began in the late 1830's in what was later called (among other businesses throughout the years) My Sister's Place Two. Mrs. Charles Hume was the first teacher. The first Superintendent was R.E. Spangler. The school was later moved in 1855 to the United Brethren Seminary until 1868 when the city purchased the building. High school classes were not held until 1884-1885. The first graduating class was in 1890 and they graduated in the upstairs of the old Grigsby Hardware and C.L. Welsh store. The first high school classes were history, geography, grammar, rhetoric, philosophy, physiology, botany, zoology, astronomy and civics. With the rising population of school aged children, a new building was erected in 1905 with the addition of a large assembly room, 2 classrooms and a gymnasium added on in 1924. The school graduated its first class from the new building with a new 4 year program in 1906 instead of the previous 3 year program. They actually had two students graduate twice from Blandinsville High School. According to a 1937 edition of the Star Gazette, Glennon Argenbright and Ethel Kline both graduated twice from the school; once in 1904 and the second time in 1906. There were no graduates found for the class of 1905. According to the 1926 edition of the Bee Hive, the school's yearbook, these classes were added to the high school curriculum-commercial, Smith-Hughes agriculture and Spanish. Tragedy struck the school on November 15, 1933 when janitor Larry Duttweiler fired up the boiler and left the building to go eat breakfast. When he came back, the building was engulfed in flames. Chemicals in the science lab located above the boiler room aided in the rapid spread of the fire. The fire also caused the loss of the community library as well as it was housed in the building at that time. All that was salvageable were some gymnasium chairs, football paraphernalia and an old piano. $10,000 was still owed from the construction of the building. Once again, the village of Blandinsville built a new school building. Classes began on September 2, 1935 in the new building. This new building was built with no bonding issue and no tax increase. In 1948 the Northwest McDonough Unit District No. 175 was formed consisting of Blandinsville, Good Hope and Sciota. 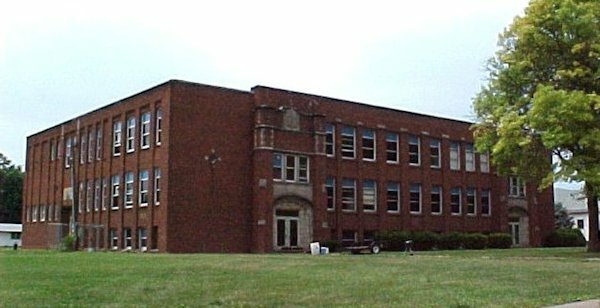 High school classes were held in the Blandinsville School until 1959 when the district built a new high school outside of Sciota calling it Northwestern High School. Blandinsville elementary used the building until the fall of 1980 when a new elementary building was built in Good Hope; at this time the building was given to the village. The Blandinsville-Hire Community Center used the building for a while and renovated parts of it including getting it a new roof. In the late 1990 s, with the roof deteriorating once again and the contractor who did it nowhere to be found, and no monies to fix it again, they gave it back to the community. In 2003 the building was purchased by a private citizen. Fast forward to 2014. The building still looked half way decent from the outside, not counting the boarded up windows of course. But a look on the inside from the parts that are being torn down already, show signs of mold and deterioration beyond repair. As in the Old B'ville Fight Song: Here Comes Old B'ville the song says Fight to the finish, Never give in! The old building never gave up, we just gave up on her. All information provided by the website: www.illinoishsglorydays.com and the Blandinsville School memory book.